Heat up 8 oz of ground beef with your favorite taco mix. Set aside. Warm tortilla in a large skillet with Gordo’s Cheese Dip and shredded cheese till melted. Set aside. Take 3 taco shells and place them together, one inside the other to fit the diameter of the tortilla and fill with taco meat. Take 2 taco shells and place them together and fill with guacamole. Repeat with last 2 shells, add lettuce tomato/pico and shredded cheese. On one half of the tortilla place the taco meat in shells closest to the center then stack the guacamole shells inside the taco meat shells. Follow with the last two taco shells….the shape should fit the half of the tortilla. 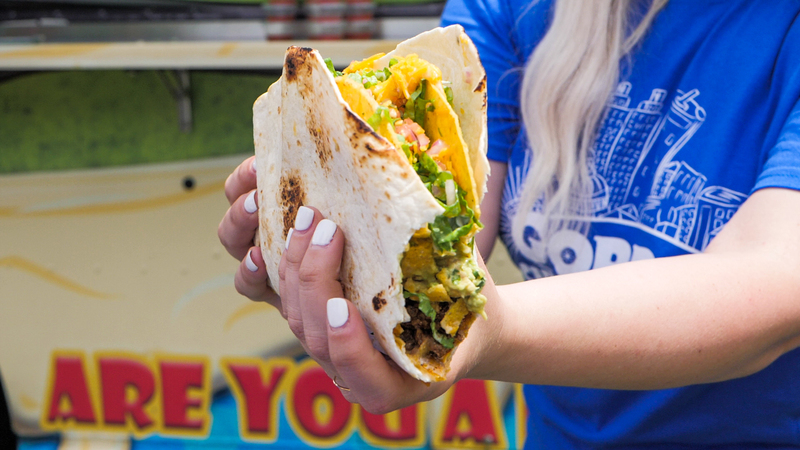 Fold over the other half and you should have 1 big Gordo 7 Layer Tacodilla! Eat with extreme caution and contents may go EVERYWHERE. But it’s so good, it’s worth the mess!